Happy Father's Day! I'm certainly a happy dad, and I've had a great day. 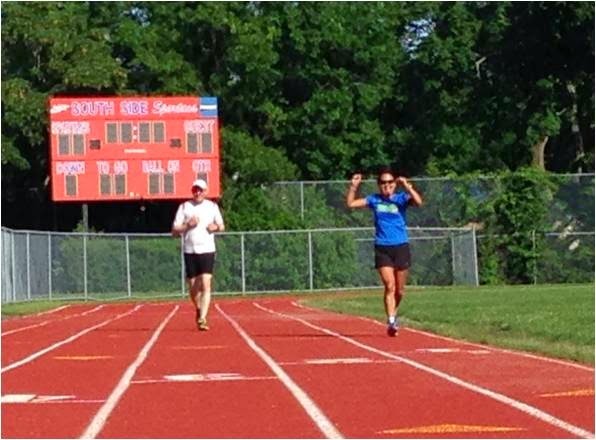 The morning started with a track workout with my running buddies. I usually do these workouts on the local high school track so traveling to SIOR's town was a nice change. My local track runs around the football field and is very isolated, while this track is located within a neighborhood and it felt somewhat quaint. SIOR ran from her home and I saw her running on the road as I pulled up to the track. TPP was already there, and we started our workout a little after 8:00 AM. The weather was sunny and the temperature was still in the low 60's. On SIOR's suggestion we alternated easy and hard quarters. Our original target was 12 laps (3 miles) but we all ended up running 14. We took off easy and I was able to hold a conversation as I ran. After one lap we dropped a gear and switched to race pace. I liked this method, using a jogging lap for recovery rather than stopping for a minute between hard laps. It kept my heart rate up and made it easier to transition to the faster paces. SIOR and TPP burned up the track the first couple of times around and I envied their speed. I did fine, averaging somewhere within the 7:00 minute range on my fast laps. I can move along when I know that I only need to endure a hard effort for two minutes or less. TPP had a case of "Too much fun the night before-itis" and took it easier on her later laps. It was no surprise to anyone that SIOR flew through her laps. At one point I tried to catch up to her, but I didn't make much progress. Per tradition, we followed our workout with a visit to Starbucks. SIOR and TPP caught up on Game of Thrones and we covered a lot of subjects. Interestingly enough, there was little mention of running. I needed to cut it short because I had some Father's Day activities. My wife and kids were going to take me to Lemonleaf Grill for lunch, but it didn't open until 1:00 PM and I'd worked up quite an appetite from all that speed work. We ended up at Quetzalcoatl in Huntington, so it was Mexican rather than Thai. But it was really good, as usual. It's been a great Father's Day spent with friends and family. 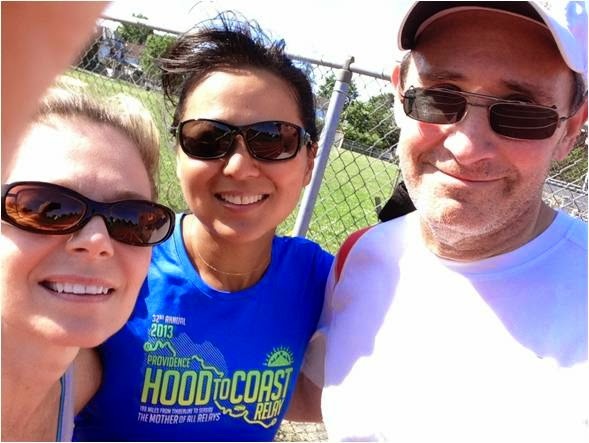 I am so glad that I got to see my Runska-buddies and do that workout with them in such beautiful weather. The day isn't finished and I'm looking forward to more family activities this evening. It was a great day indeed~ I'm glad we were able to share it! I had a great time with you guys today. BTW, your blog isn't letting me post comments right now. Happy Fathers Day. Hope to see you at the Dirty Sock Run. "Bailey" & I have started running again after the all clear from my cardiologist (Minor non-scare issue). Hey, great to hear from you. I want to know more about this cardiac thing. I'm glad you and Bailey are back to running - see you at Dirty Sock! Ditto. My target dates/races are 1. Run Around the Lake 2. Dirty Sock Run & 3. Cow Harbor Run. I tis frustrating after a long layoff to get back to a respectable time, but it is fun. Do you plan on any practice runs?......See you! I'll send some suggested days. Are Saturdays or Sundays better for you?